The FIAT Stilo reaches Britain's roads in February and the big question has to be, why buy a Stilo rather a Focus or a Golf? You might buy an Astra because some of them are British; you might buy a Civic because they're British, they're Honda and they have a clever interior; you might buy a 307 because you loved your 306; you might buy a LEON because they're good looking, good value and fun; you might buy a Xsara because you think you can't afford not to. But what has the successor to the lack-lustre Bravo and Brava got going for it? Why should you shell out your hard-earned on it rather than the other mid-size cars that are tugging at your heart-strings, your purse-strings and your common sense? The answer has to be the interior. Like Honda did with the Civic and is about to do with the Jazz, and like Peugeot disappointingly didn't do with the 307, FIAT has completely re-thought its seating plan. As with mini MPVs in the same market sector, the five-door Stilo has been designed to be easy to get into and out of with plenty of room inside and a high driving position to give a feeling of control. 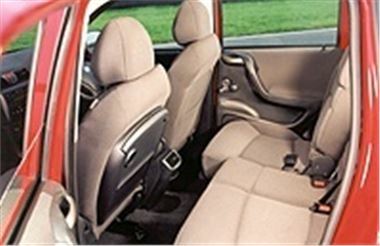 The front passenger seat tilts right forward or folds down to form a table to accommodate long loads or act as a work surface. Airline-type folding tables pull down from the front seat squab so that children can eat or draw, or adult rear passengers can write or work on a laptop. The rear seats slide, recline and tilt independently so luggage space can be exchanged for passenger space and vice-versa. There is a ski flap, storage compartments with flaps, a child seat built into the rear seat, and three roomy closed compartments on the facia (one is cooled on cars with air conditioning), and both front and rear armrests contain compartments. There are roomy container under both front seats, generous pouches and five cup-holders. Both 3-door and 5-door Stilos share all the latest safety equipment, including up to eight airbags, six of which are standard equipment, three rear head restraints and three 3-point rear seatbelts There are disc brakes on all four wheels, and ABS anti-lock braking with EBD and ASR is standard. Three trim levels are available: Active, Dynamic and Abarth, with a choice of four petrol engines of between 80bhp and 170bhp and a 115 bhp direct injection common rail (JTD) diesel. Manual gearboxes are five or six speed or Selaspeed semi automatic. Optional features include, adaptive cruise control, the CONNECT infotelematic system with voice commands for the phone, a voice memo and WAP internet access, rear side airbags, a louvered sunroof and an MP3 music player. Both models are 1,760mm wide, but the 3-door is 4,180mm long and 1,460mm high while the 5-door is 4,250mm long and 1,760mm high. The pricing structure is that for any engine capacity increment, say from 1.2 16v to 1.6 16v, you pay an extra £500; for a trim level upgrade £1,000; and to go from a 3-door to a 5-door version will cost £500. Selespeed transmission costs £800. This means you can simply assemble the cost of the car you want from the basic entry level price.